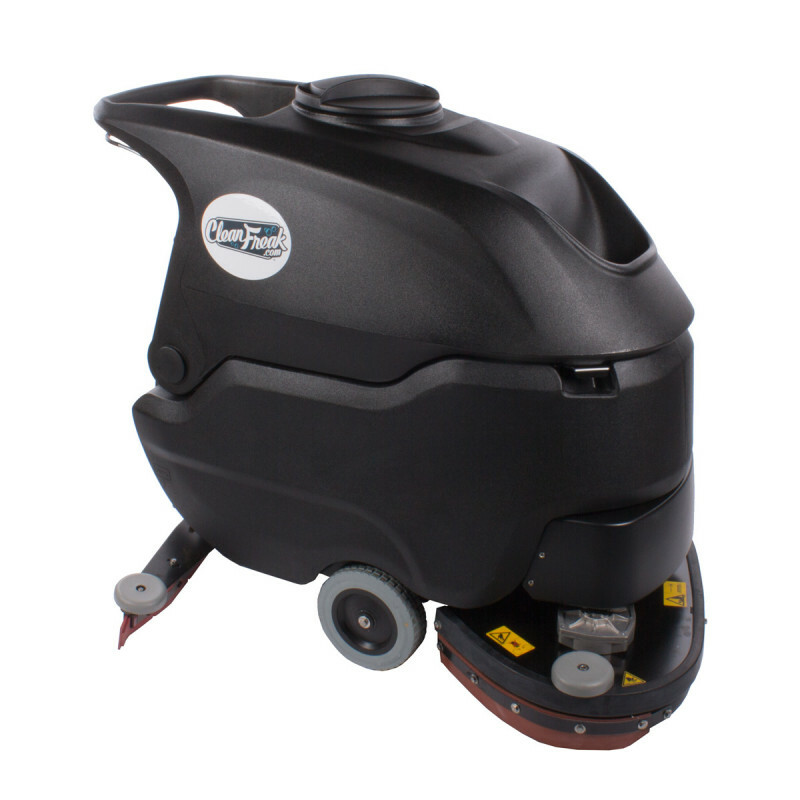 This 24" walk behind scrubber comes with two 12" pad drivers (please see the warning below) and is an industrially rated machine that will cover wide areas in a small amount of time. Scrub pads and/or brushes (nylon & tynex) need to be purchased separately depending on the type of floor you'll be cleaning. The 19 gallon solution tank ensures you will have plenty of solution to scrub the widest areas, and be able to continue without stopping to refill. This is the only 24" scrubber on the market that is a brush driven model. We have designed the entire system, so the two pad drivers or brushes essentially pull the machine along as you scrub. All you need to do is provide a little momentum, and guide it in the correct direction. You can essentially push the machine along with a single finger while it's scrubbing! We tried to make this machine as simple as possible, because we wanted to make a machine that would last a long time with the most minimal amount of maintenance. We took out the traction drive and few other components figuring the less parts on the machine, the less likely something may break down in the long run. This wide area scrubber is guaranteed to give you years of relatively maintenance free service. If you are looking for something larger, or smaller, or possibly something with an electrical cord for power, please take a look at our complete line of walk behind auto scrubbers. The Performer 24 is the big brother to our Performer 20 hard floor scrubber. Both are true workhorses, that can manage any scrubbing situation from a commercial to industrial setting. The Performer line of scrubbers are perfect for wide, large open areas, where speed is a factor in cleaning. We also offer this auto scrubber in a package that we call our industrial floor scrubbing combo. This package offers everything you could possibly need to get started and scrub your floors for an extended period of time. You receive 5 FREE cases of floor wax stripper, 2 strip brushes, 2 nylon scrub brushes, 5 cases of 12" black pads, 5 cases of 12" red pads, 1 replacement rear squeegee blade, 1 replacement front squeegee blade, 5 cases of low foaming degreaser, 1 case of defoamer, and 2 wet floor signs. We throw add in the stripping solution at N/C, so overall, you receive 5 FREE cases of stripping solution! 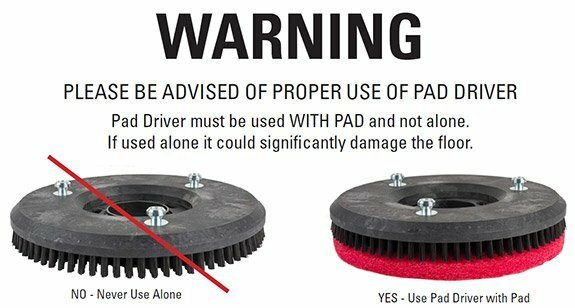 2 pad drivers and/or brushes (pad drivers come standard with the unit, nylon & tynex brushes are sold separately) are placed slightly off kilter of each other to provide a 24" seamless scrub path. 19 gallon solution tank provides enough solution to scrub large industrial settings without stopping. 20 gallon tiltable recovery tank allows you to recover solution from large areas, and then easily clean it out. 24 inch wide area scrub path covers up to 24,000 square feet per hour of maximum scrubbing capacity. Squeegee system leaves a smooth floor bone dry during the recovery process. Solution control with automatic shut off saves water and chemical solutions, eliminating waste and maximizing your profit dollars. Customers who were interested in the CleanFreak® 'Performer 24' Wide Area Floor Scrubber were also interested in the following items. Such an easy machine to use. I am such a fan of this auto scrubber. It is so easy to use and does a great job of scrubbing. I was very skeptical about it not having a motor to push it along, but I can easily walk behind it, and the brushes pull the machine along making it extremely easy to maneuver. A+ machine! We have bought Five of these machines that are being used in an industrial setting and for the price of them the value is there, so far not to many issues with them other then ordinary wear. This is a review for the CleanFreak® 'Performer 24' Wide Area Floor Scrubber.